استفاده از تحلیل شبکة اجتماعی برای بررسی نوع روابط بین ذی‌نفعان و کنشگران در مدیریت منابع طبیعی، به منزلة روشی علمی، کاربرد فراوانی یافته است. تحقیق حاضر با هدف تحلیل شبکة تبادل اطلاعات در بین سازمان‌های فعال در مدیریت پایدار منابع طبیعی در حوضة سد البرز در استان مازندران بر مبنای رویکرد تحلیل شبکة اجتماعی صورت گرفت. بر اساس نتایج تحقیق، دسترسی و اشتراک اطلاعات در بین سازمان‌های مورد مطالعه به‌آسانی صورت نمی‏گیرد و سطح ارتباطی متوسطی میان سازمان‌ها وجود دارد. در شبکة اطلاعاتی این سازمان‌ها سازمان جهاد کشاورزی از قدرت متوسطی در شبکه برخوردار است. دانشگاه‌ها، سازمان جهاد کشاورزی، و مرکز تحقیقات کشاورزی و منابع طبیعی نقش مهمی در تسهیل و تسهیم اشتراک اطلاعات با سایر سازمان‌ها دارند. بر اساس نتایج تحقیق، سازمان‌های غیردولتی در تبادل اطلاعات در این شبکه نقش منفعلی دارند و در فرایند اطلاعات‌دهی به سایر سازمان‌ها پویا نیستند. در تحلیل فرایندهای قانون‌گذاری و ارتباط آن با شبکة تبادل اطلاعات سازمان‌ها مشخص شد که ادارة کل منابع طبیعی و آبخیزداری نسبت به سایر سازمان‏ها در این زمینه دارای قدرت بیشتری است . Bodin, O., Crona, B. and Ernstson, H. (2006). Social networks in natural resources management: what is there to learn from a structural perspective? Ecol. Soc, 11(2), r2. Bodin, O. and Crona, B.I. (2009). The role of social networks in natural resource governance: What relational patterns make a difference? Global Environmental Change, 19, 366-374. Eglali, F., HassanPoor, R. and Asgari, A. (2008). WUA program implementation workshop, Workshop proceedings, 10-11 June 2008, Ghaemshahr Azad. FAO (2006). Global Forest Resources Assessment 2005: Progress towards Sustainable Forest Management, FAO Forestry Paper 147, Rome, Forestry Department, Food and Agriculture Organization of the United Nations. Forest and Range Organization of Iran (2001). The long term plan of Forest and Range Organisation of Iran for evolving renewable natural resources, Forest and Range Organization of Iran (Persian), Tehran. Forest Range and Watershed Management Organization of Iran (2005). Iran’s Natural Resources: Yesterday, Today and Tomorrow, Livestock and Agri-bussiness Mahnameh, Tehran. Haythornthwaite, C. (1996). Social network analysis: An approach and technique for the study of information exchange, Library & Information Science Research, 18( 4), 323-342. 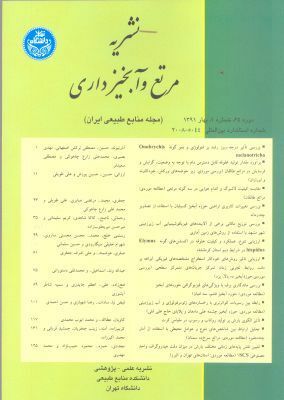 Ghorbani, M., Azarnivand, H., Mehrabi, A.A., Bastani, S., Jafari, M. and Nayeb, H. (2012). Social network analysis: A new approach in policy-making and planning of natural resources co-management, Journal of Natural Environment, Iranian Journal of Natural Resources, 65(4), 553-568. Isaac, M.E. (2012). Agricultural information exchange and organizational ties: The effect of network topology on managing agro diversity, Agricultural Systems, 109, 9-15. Karamidehkordi, E. (2010). A country report: challenges facing Iranian Agriculture and Natural Resource Management in the twenty-ﬁrst century, Hum Ecol, 38, 295-303. Kirchhoff, L. and Stanoevska, S.K. (2008). Thomas Nicolai & Matthes FleckUsing social network analysis to enhance information retrieval systems. www.orgnet.com. Mohammadi Kangarani, H., Shamekhi, T. and Hasanzadeh, M. (2011). The Study and Analysis of Informal and formal networks with social network Analysis, Governmental Management, 3(6), 149-164. Pereira, C.S. and Soares, A.L. (2007). Improving the quality of collaboration requirements for information management through social networks analysis, Information Management, 27(2), 332-342. Sepehri, M.M. and Riahi, A. (2010). Application of social network analysis for extracting of requirements of Knowledge management System in knowledge based organization, Technology and science Policy, 3.2. Stein, C., Ernstson, H. and Barron, J. (2011). A social network approach to analyzing water governance: The case of the Mkindo catchment, Tanzania, Physics and Chemistry of the Earth, 36, 1085-1092. Weiss, K., Hamann, M., Kinney, M. and Marsh, H. (2012). Knowledge exchange and policy inﬂuence in a marine resource governance network, Global Environmental Change, 22, 178-188.